It's time to heat things up! The S/S 2011 "Palm Springs" Collection is all about those Southwest roots, embellishing geometry, and a raw natural edge. What makes this collection unique and extremely fun, is that it can just about, play up any look or style. Wear it with an outfit composed of all white for a crisp, elegant look, go with faded black jeans and biker boots for rocker chic, add a long floral skirt and fringe vest for a bohemian style, just add any piece from Garage Gypsy's "Palm Springs" collection and it will kick a little bit of funk to your outfit. CLICK HERE to get shopping!! These pieces are not mass produced- so get them while they're still available. On the Streets of Paris during Fashion Week. How can't you not love this. Looking at the fabulously dressed, makes me want to immediately hop onto a plane and jet across the seas to Europe. Milan, Paris, London...I want to explore them so badly! I couldn't help observing all of the long sheer silk and chiffon skirts. Love it! Get ready to see more. From the new "BURNING EDGE" Collection. Burning Edge is a new line of clothing that combines sheer elegance with an element of rawness. Inspired by the delicacy and beautiful flow of fine silks and soft sheers. Unique to this collection is the finish to the unhemmed edges designed to preserve the characteristics of the fabric, lending hand to it's state of rawness. The line of feminine skirts and dresses incorporates a flair of originality and chic simplicity while keeping with the trends. SHOWN: Long sheer maxi skirt with two inch elastic waist. Available in any size/ length. Created from personally selected materials, sewn and finished by hand in a small studio under the California sun. Made to order-production time is 2-4 days. Sheer Melba Skirt is available in other colors. Click here to shop. You're sitting in a small Parisian cafe with a plate of fruit and strong cup of coffee observing the European styles and culture. Wearing a classic striped tee from MNG, arms layered in bangles, red spike pumps, a blue beret, and pearls. Be Playful, don't forget your style, get Garage Gypsy Jewelry. Today I kept it simple and chic by taking a classic look and spinning in a splash of bohemian style. I went with soft eye make-up and rosy red cheeks, a muted color scheme in my ensemble and vibrant turquoise feather earring by Garage Gypsy Jewelry. Perfect for a low key day of work in the Beverly Hills office. I just watched St. Elmo's Fire, a 1985 feature starring Rob Lowe, Emilio Estevez, Demi Moore, and Andrew McCarthy for the first time last week. Netflix directly to your television is pretty amazing. Its a great companion when working. I'm a total 80's flick girl. Most modern-day MTV/reality TV is such a bore to me. I see more artistic expression and authentic energy in older movies and television shows. 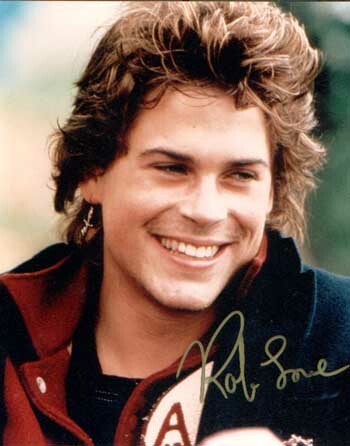 I absolutely loved Rob Lowe's style in St. Elmo's Fire. He rocked cross shaped earring in one ear, that I fell in love with. I took note. Men, you should too. Funny thing is, last night I attended a wrap-party at The Hudson for a new Lifetime feature, where I saw a gentleman in a fabulous get-up rocking a single tusk earring. I hope to see more of this in the future! I watched Flashdance for the first time when I was a Junior or Senior in high school. In short, it changed my life. Okay, not completely, but it has been an inspiration in more than one way. 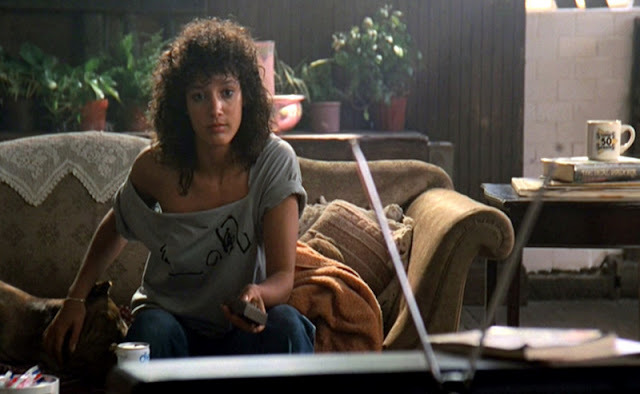 Upon watching Flashdance I instantly admired Jennifer Beals' character, 'Alex.' Of course, having danced for ten years myself, that was an instant common interest I shared with her character, but mostly I admired her independence and drive as a young woman. I envied the life 'Alex' created for herself; her apartment, jobs, style, and dedication to a dream. When I was seventeen, I thought- if this girl can do all this at eighteen, so can I. And, well, that's exactly what I did, only with different ambitions, in a different city. My daily style is still influenced by the dancer. Jennifer Beals wears a slashed neck graffiti print t-shirt, ripped sweater, Lycra keep-fitters, torn jeans, cropped vests and pushed-down leggings for dance or slouch dress. Out and about in chilly Pennsylvania she chooses a heavy topcoat, over sized jumpers, several scarves worn at once, wide man-styled jackets (all with plentiful layering), leggings, skinny trousers, thick-soled boots, a red military dress coat, even a green army jacket with insignia patches. 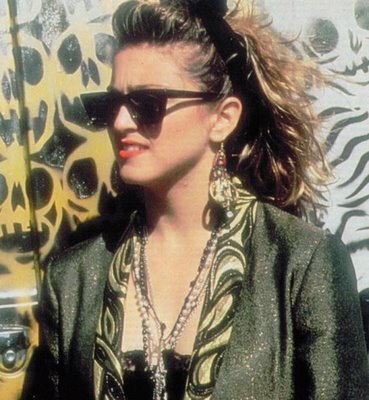 I fell in love with Madonna and her radical style when I saw her music video for "Vogue" for the first time on 01.01.91. Yes, I even know it down to the date. I was just four, when I was watching the NBC New Years Countdown on TV with my parents. In Times Squares they were projecting the top songs/music videos of 1990 onto a large screen, in which aired on TV. Little did my parents know how much taping this hour long program would affect my style and taste in music. Not only was I introduced to Madonna, but MC Hammer, Paula Abdul, Vanilla Ice, and Billy Idol. I ended up loving them all, watching this VHS tape well until I was in high school. What can I say, I love what I love. Who inspired / inspires your style? I'm always a sucker for a carnival. Between the smell of food on the grill, winning goldfish and playing bumper cars- its just good wholesome fun. Even when the day seems to be at its worst, you can always make yourself feel a little brighter with the right ensemble. 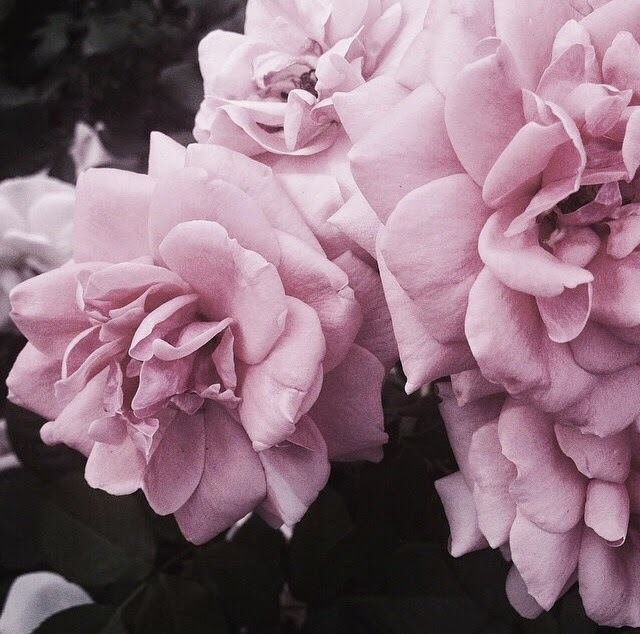 Lavish yourself in the pretty things, the ones with a sentimental feel. Clothing can be like comfort food for the body.